California Vacation Planning > > California Travel Ideas Blog > Blog for Wine Country > Napa Vacation Going To The Dogs? Fido is as much a member of the family as anyone. We get that. And we know you probably want to take him along, even on your Napa vacation. We have great news: Fido is welcome! Over 50 California Wine Country wineries are now “dog friendly,” although sanitation concerns may impose limitations on your visit, especially if you wish to tour the vineyards and the wineries. Enter Dan Cartwright, a professional dog trainer who lives in Napa, who is now offering personally guided dog-friendly wine tours. Dan will meet you (or pick you up) and take you to wineries that allow dogs. Alternatively, if you want to visit a winery that doesn’t allow dogs, Dan can babysit your pooch, instead. How cool is that? If you are planning to stay in Napa for a few days, check out the hotels listed in our Napa Valley hotels article, some of which are pet-friendly. 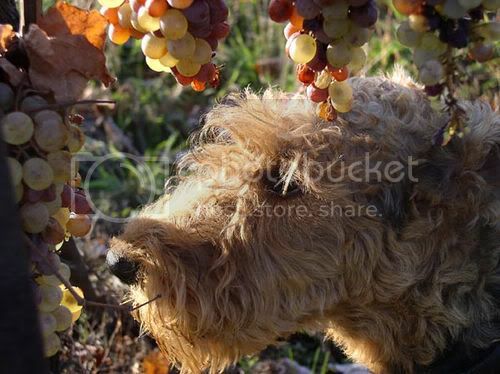 Photo of Dog in the Vineyards by amonja via flickr (Creative Commons).